The Department of Philosophy offers two programs leading to an MA in Philosophy: the Accelerated MA program and the regular MA program. 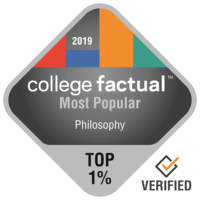 The ACCELERATED MASTER OF ARTS IN PHILOSOPHY PROGRAM (AMP in Philosophy) enables academically talented University of Arizona undergraduates to complete the B.A. and M.A. in philosophy after five years of study beginning with the student's freshman year as an undergraduate. This program is intended both for students interested in enhancing their qualifications for admission to other graduate programs (such as Ph.D. programs in philosophy or J.D. programs at law schools) as well as for students interested in an additional year of philosophical study but without any plans for future academic work. Students will typically apply for AMP in Philosophy in Spring semester of their junior year. If they are accepted, they will be notified in that same semester and in time for them to enroll in appropriate classes at the start of their senior year so as to enable them to complete AMP in one additional year beyond their senior year. To be eligible to apply, students must meet the Admissions Requirements established by the Graduate College which include a minimum cumulative GPA of 3.3. For more information about admission requirements, how to apply, and the AMP program requirements, please visit grad.arizona.edu/admissions/types/accelerated-masters-programs-amp . An online application form may be accessed on the UA Graduate College site. The REGULAR MASTER OF ARTS IN PHILOSOPHY is a two year program available to a limited number of students who will have completed the Bachelor's degree prior to beginning their graduate studies. For more information about the admission requirements, how to apply, and the MA degree requirements, please visit grad.arizona.edu/prospective-students . Neither admission to nor completion of the M.A. program ensures subsequent admission to the doctoral program. The M.A. program does not offer graduate assistantships or tuition waivers. For questions, please contact M.A. Program Director, Mark Timmons.